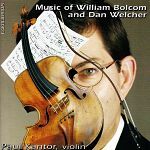 With recording quality as clear as day, Dan Welcher’s violin concerto bursts in. Its 27 minutes are divided between three movements entitled Games and Songs, March, Quickstep, and Duel and Lullabye [sic] and Tarantella. Written in 1993, Welcher admits to wanting to write something “more charming than profound,” homed to G major, and a piece to stand alongside Mozart’s concerto in the same key and Prokofiev’s first and Stravinsky’s concertos. 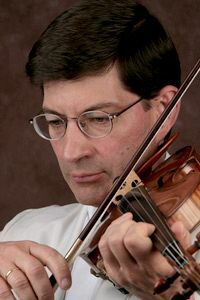 Paul Kantor is currently the Sally Shepherd Perkins Professor of Violin at the Shepherd School of Music at Rice University having previously served as the Eleanor H. Biggs Distinguished Professor of Violin at the Cleveland Institute of Music. He received his Bachelor of Music and Master of Music degrees from the Juilliard studying violin with Dorothy DeLay and chamber music with Robert Mann. For thirteen years he served as Chair of the String Department at the University of Michigan and has taught at the Juilliard School, the New England Conservatory and Yale University. He continues as Artist in Residence at the Glenn Gould School of Music/ Royal Conservatory of Music since his appointment in 2008. Along with his son, violinist Timothy Kantor, he founded and directs the Gabriel Del Orbe Violin Program in the Dominican Republic. Additionally, he has presented master classes at the Starling-Delay Symposium, Indiana University, the Eastman School, the University of Southern California and the New World Symphony, among others. His students consistently win major awards at important violin competitions including the Indianapolis, Montreal, Stulberg, Buenos Aires, Klein and Fischoff. For the past 37 years he has been on the Artist/Faculty of the Aspen Music Festival & School where he has been concertmaster of both the Festival Orchestra and the Chamber Symphony. He has performed as soloist with numerous symphony orchestras as well as serving as concertmaster of the New Haven Symphony, the Lausanne Chamber Orchestra and the Great Lakes Festival Orchestra. Kantor was a member of The New York and Lenox string quartets, the Berkshire Chamber Players and the National Musical Arts Chamber Ensemble in Washington, D.C.
Mr. Kantor has performed the world premieres of Dan Welcher's Violin Concerto, (subsequently recorded with Larry Rachleff and Symphony II) as well as John Corigliano's "Red Violin Caprices". His recordings can be found on the labels of Equilibrium, CRI, Delos and Mark Records. In 2014 he was honored with the Artist Teacher Award from the American String Teachers Association. He is married to pianist Virginia Weckstrom. Larry Rachleff is Walter Kris Hubert Professor of Music and Music Director of the Shepherd School Symphony and Chamber Orchestras. Mr. Rachleff also serves as Music Director of the Rhode Island Philharmonic; he has also been Music Director of the San Antonio Symphony. A former faculty member of Oberlin Conservatory, where he was Music Director of Orchestras and Conductor of the Contemporary Ensemble, he also served as conductor of the Opera Theatre at the University of Southern California. He has conducted and presented masterclasses all over the world, including the Chopin Academy in Warsaw, the Zurich Hochschule, the Sydney and Queensland, Australia conservatories, the Juilliard School, the New England Conservatory, and Royal Northern College in the U.K.
Larry Rachleff is an enthusiastic advocate of public school music education. He has conducted All-State orchestras and festivals in virtually every state in the United States as well as throughout Europe and Canada. He has also served as principal conducting teacher for the American Symphony Orchestra League, the Conductors’ Guild and the International Workshop for Conductors in the Czech Republic. As a dedicated advocate of contemporary music, Mr. Rachleff has collaborated with leading composers including Samuel Adler, the late Luciano Berio, George Crumb, Michael Daugherty and John Harbison among others. Larry Rachleff lives in Houston with his wife, soprano Susan Lorette Dunn, and their young son, Sam. 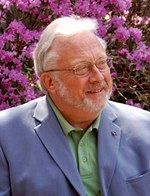 Named 2007 Composer of the Year by Musical America, and honored with multiple Grammy Awards for his ground-breaking setting of Blake’s Songs of Innocence and of Experience, William Bolcom is a composer of cabaret songs, concertos, sonatas, operas, symphonies, and much more. He was awarded the 1988 Pulitzer Prize in Music for his Twelve New Etudes for piano. As a pianist he has recorded for Advance, Jazzology, Musical Heritage, Nonesuch, Vox, and Omega. For 40 years throughout the United States, Canada, and abroad, he has performed and recorded with his wife, mezzo-soprano Joan Morris. Bolcom taught composition at the University of Michigan from 1973-2008. Named a full professor in 1983, he was Chairman of the Composition Department from 1998 to 2003 and was named the Ross Lee Finney Distinguished University Professor of Composition in the fall of 1994. He retired from teaching in 2008. In addition to their performances, Bolcom and Morris have recorded over two dozen albums together. Their first one, After the Ball, garnered a Grammy nomination for Joan Morris. Recent recordings include: two albums of songs by lyricist E. Y. “Yip” Harburg and Gus Kahn on Original Cast Records; Bolcom’s complete Cabaret Songs, written with lyricist Arnold Weinstein, on Centaur; and Someone Talked! Memories of World War Ii with tenor Robert White and narrator Hazen Schumacher. Recent recordings of his works include: From the Diary of Sally Hemings, written with playwright Sandra Seaton, performed by soprano Alyson Cambridge and pianist Lydia Brown, and available on White Pine Records; Little Suite of Four Dances and Concert-Piece with clarinetist Maureen Hurd and available on MSR Recordings.